Social anxiety in children is fear and phobia related to situations where they have to interact with other people or be the focus of attention. Children may worry that people will think badly of them, or that they will behave in public in an embarrassing way. Children with social anxiety are often quiet, obedient and shy in preschool/school, and do not voice their fears. They may experience physical symptoms such as nausea, stomachaches, blushing or trembling. How Can I Help My Child Overcome Social Anxiety? Most children can learn to manage their social phobia and connect happily with others. They merely need encouragement and support to understand and cope with these feelings. Teach your child that those worries and physical feelings he or she may be feeling, have a name: Anxiety. Explain that anxiety is normal and that it helps people adapt to and prepare for dangerous situations. Explain that anxiety is a problem when our body acts like there is danger, but no danger exists. Let your child know that it is normal for people to feel worry or fear when they are around other people or they have to “perform” in front of people. Explain that this kind of fear is called: Social Anxiety. Tell your child about a time when you experienced social anxiety. Describe how you felt, and be sure to share how you “survived” this anxious experience. Stay calm – Take deep breaths, slow your speech, and keep your facial expressions calm. Show you care – Offer kind words, provide comforting touch and be responsive to your child’s requests. Express your concern – Listen to your child and take time to talk through the situation. Remember that anxiety is a physiological response to perceived danger. Criticism or punishment will only produce greater stress. Do Not force your child to talk or do things when you’re with other people. Do Not call your child “shy” in front of other people. No matter how frustrated you may feel, Do Not criticize or discipline your child because they had difficulty in a social situation. Social anxiety can be made much worse if it is coupled with unrealistic expectations or perfectionism. Kids need to be kids! Show pride in your child’s efforts at school or in life, not in perfection. Prioritize joy over accomplishments, by practicing random celebrations. Encourage hard work, but embrace all results. Your child will benefit from preparing for social situations either by talking about it or pretending before the actual event. Anticipate potential worries by talking about them with your child. Plan what your child can say and do in upcoming situations. Practice social skills, such as greetings, expressing concerns, or requesting help, by acting them out in a comfortable environment. Read books or even videos about social and emotional issues to help you talk with your child. It may be easier for your child to develop friendships at home where they are most confident. Invite one friend at a time to come over for a play date. Plan activities with your child, that your child enjoys and feels comfortable doing. Keep playdates short to minimize stress, but do them regularly to increase confidence. Your child needs to practice being in extended social situations and learn that parties and celebrations can be enjoyable. But it is also important that these events are positive experiences. Hold celebrations at your own home or happy familiar places. Find out ahead of time, what activities (food, people, etc.) will be at parties, and discuss them with your child beforehand. Practice how your child will say no to activities or foods that may make them uncomfortable. Set your child up with a specific friend or sibling who will be a partner at the party. Or ask to join the party as a parent helper. Plan a way for your child to contact you if they are ready to leave early, or provide an excuse for picking your child up early to limit stress. Avoid placing your child in situations that will cause high stress, such as overnight summer camps. Invite one friend at a time to come to your house for a sleepover. Do sleepovers at a cousin’s or a grandparent’s house. Talk about and plan what will happen. Make sure to practice for anything that you and your child anticipate as a potential problem. Have a plan for a polite way that your child can come home if they need to end their stay. Your child can face his or her fears and find the joys in social activities by joining a group. Choose a group or activity together, then prepare and plan ways to cope with anxieties that may arise. Your child will cope with anxieties much better when he or she gets enough sleep. Conversely, a difficult night should be followed by a day with minimal stress. Develop a relaxing and pleasant bedtime routine. Avoid stressful mornings to help your child get a good start on the day. Rise with plenty of time for breakfast, morning preparations and hygiene. Keep it positive with encouraging statements. Add happy elements to the morning, like a walk, personal playtime or time with a parent before rushing out of the house. Commit time and energy to providing nutritious food that helps your child maintain their energy throughout the day. Plan breakfasts low in sugar and high in protein to maintain energy. Make sure your child has healthy snacks for school and is eating an adequate lunch. Be aware of foods that may cause your child physical discomfort or frequent bathroom trips during school. Teach your child that all successful people learn and use positive strategies for coping with difficult situations. Help your child identify their anxiety symptoms and teach them to use specific coping techniques. Talk about feelings and fears. Make plans for stressful situations. Make and use “cognitive coping cards” to help manage anxiety. Your anxious child will benefit greatly from learning relaxation techniques. Teach your child to use techniques for calming their fears when anxiety threatens. Practice breathing exercises. Take a slow breath through the nose. Exhale through the mouth. Make time for relaxing and enjoyable activities. Children with anxiety often create big problems out of little things. Your child will benefit from developing realistic thinking to avoid exacerbating their fears. It is important for your child to face fearful situations and succeed. If he or she makes a habit of avoiding fears, this can lead to greater anxiety. Identify and group fears in lists. Order fears from least scary to most scary. Help your child make a specific goal to face one of their fears and help them plan for it. Praise your child often for small steps and big accomplishments dealing with his or her anxiety. I made friends with ________. I went to ______’s party even though I was nervous. I jumped in the deep end of the pool when I was only 6. Be sure to let adults who interact with your child know about his or her social anxieties and ways to help your child experience success. Ask adults to be sensitive to your child’s needs. Encourage adults to support strategies your child is using to cope. Ask about supports and services that may be available at your child’s school. If self help strategies don’t work, or social fears prevent your child from participating in everyday activities, enjoyable events, or from making lasting friendships, he or she may need professional help to overcome fears. Explain your concerns to health care professionals. Seek diagnosis and help from your doctor if your are worried that your child’s fears are hugely out of proportion or are not benefiting from self-help strategies. Thank you so much for this post. I found a lot of the social anxiety issues are tied to a desire to be perfect and a fear of making mistakes–but I haven’t known how to convey that it’s okay to make mistakes. 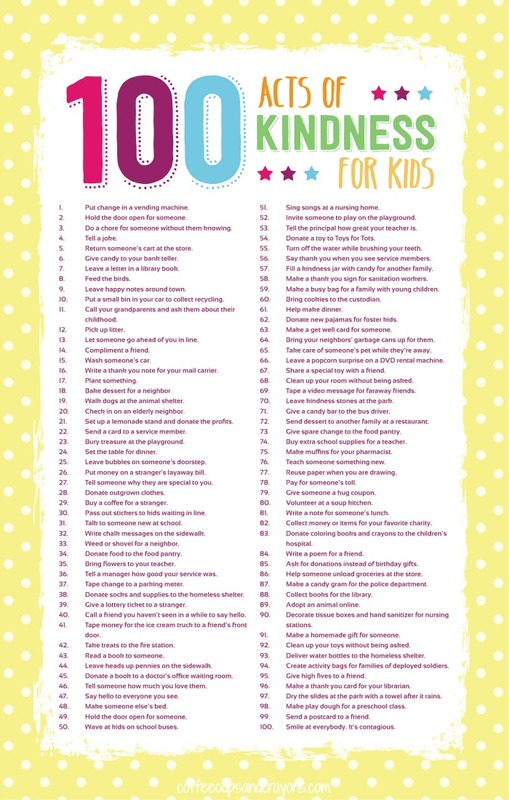 I’m printing the 100 acts of kindness out right now. Thank you so much for posting this article. Has anyone had experience with encouraging their socially anxious child to do sports, without setting up a situation where they get too focused on whether or not they are winning?